This raksha bandhan if you're hoping to pick up something fun and quirky, you've got to check out Papercup's collection. Sassy sisters and brothers are too cool for the usual boring something this Raksha Bandhan. Instead this year add some fun to the traditional siblings' day with quirky gifts and rakhis from Papercup. 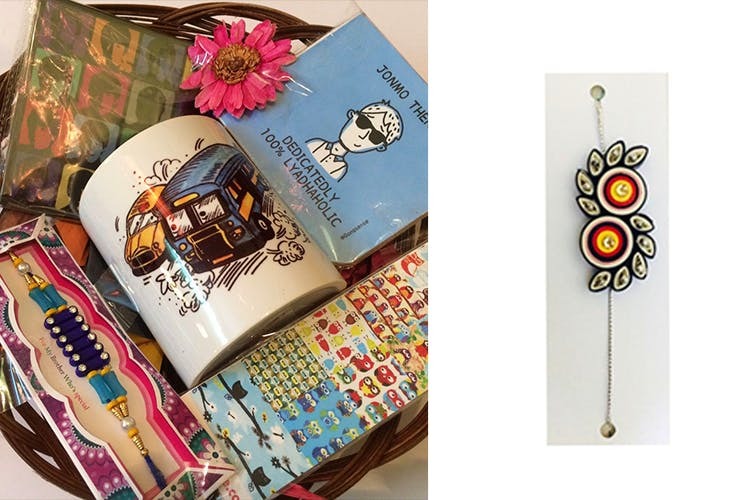 A funky stationery and decor brand, Papercup has come up with their range of handmade rakhis and cool hampers that fits well within our budget and matches up to our sibling's swag. Made with paper quilling, beads, ribbons and other accessories, their rakhis are available from INR 50 onward. The hampers are interesting too and come in a nice little cane basket. They include a coffee mug, a seriously kitschy pocket notebook, a coaster, a bookmark and a rakhi. You can pick them online at their store or at Oxford Bookstore and Terminal_11. Pick the hampers and rakhis well ahead because these get off the racks real fast!